Top Touch Painting Services brings fifteen years of painting experience to bear on your projects, whether those involve touching up the paint on a porch or colouring the exterior and interior of a whole apartment complex. We take great pride both in making your satisfaction our central goal, and in the craftsmanship and individual attention we bring to each job, ensuring that your building is painted to the highest standards. We are thoroughly qualified not only to paint your residential or commercial property but to carry out maintenance as well, at your option. 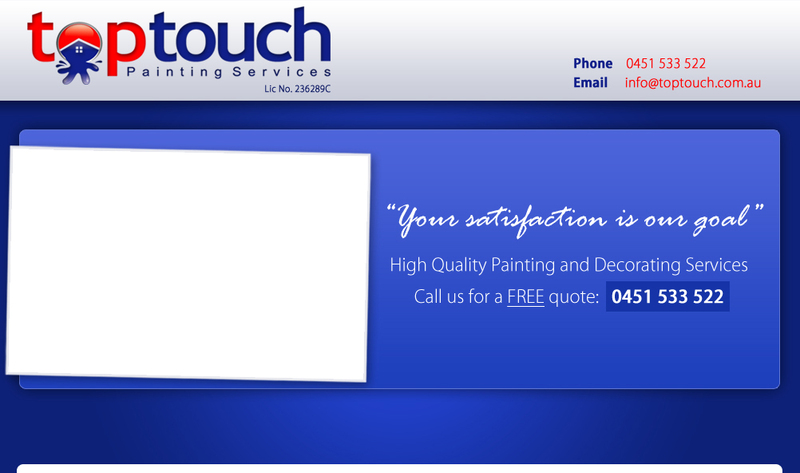 Top Touch Painting Services always makes use of the best quality materials and paints that are available on today’s market. This, plus the fact that we guarantee all of the work we do, is your assurance of the excellent, long-lasting results that we will provide to you. Our work is fully insured, and we also use paints that are formulated not only for durability, but to have as little environmental impact as possible. The future of the planet is as important to us as it is to you, and we work to have as little ecological effect as may be, while still providing you with the superlative results you expect. We are verified contractors listed by Trades Monitor , are certified Green Painters and are members in good standing of the Master Painters’ Association of New South Wales. More than any of our professional qualifications, however, you can count on us because of our unswerving dedication to the customer’s satisfaction, and our integrity, honesty, plain, straightforward estimates, and focus on communication. We do not merely work for you – we work with you too, at every step of the process, to ensure that your expectations are being met in every way.